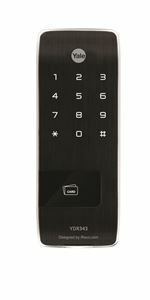 Yale YDR343 has two access solution, PIN code or RF Card key for you convenience. Only if a user pushes two safe button simultaneously affixed to the thumb-turn knob, the user can turn the thumb-turn knob. Its security is improved compared to a normal knob. Once you lose your key, it has no validation as long as you re-register rest of your key. It is the Solid and thin design using digital keypad on a solid base. When there's fire, it detects the temperature of the inside. It not only goes off an alarm but also release the lock status automatically. To prevent the PIN code from being exposed, it allows you to enter Fake number before or after entering your Pin code.